Police say residents in a South Jersey community woke up Sunday morning to find unwanted fliers posted along their street. CINNAMINSON, New Jersey -- Police say residents in a South Jersey community woke up Sunday morning to find unwanted fliers posted along their street. 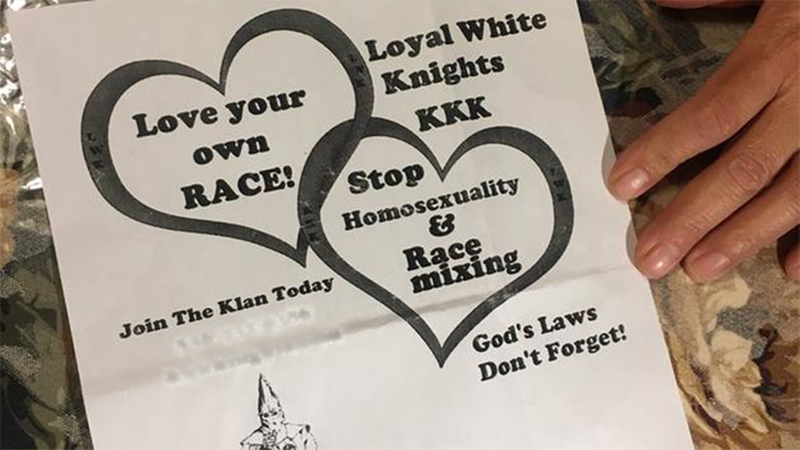 Ku Klux Klan and hate fliers were reportedly left along driveways on Forklanding Road in Cinnaminson. The fliers stated "love your own race" and "stop homosexuality and race mixing". Cinnaminson police are investigating, but do not think that any one person or resident was the intended target. The Cinnaminson Police Department received a call from a resident reporting hate literature found along Forklanding Road today. The police are investigating the incident. At this time it does not appear that any person or residence was specifically targeted. There is no place for hate or intolerance in Cinnaminson. Anyone with information is asked to call the Cinnaminson Police at 856-829-6666. "This message of hate - whether it stems from some lone individual with a printer, or some group of anonymous, hateful people - has absolutely no place in our community, or any community. The Southern Burlington County Chapter of the NAACP condemns it fully, and urges local leaders in the region and throughout the State, from all ethnic, political, and religious backgrounds, to do the same forcefully. Clearly, the fight for civil rights is not over in New Jersey. The Southern Burlington County NAACP has the full support of the New Jersey State Conference NAACP as this struggle continues!"